This article is about the baseball player. For the holiday, see Leon Day (holiday). During World War II, Day served in the United States Army, landing on Utah Beach on D-Day. He was discharged in February 1946, and on May 5 of that year pitched an Opening Day no-hitter against the Philadelphia Stars. In 1950 he left the United States to play in Canada, with the Toronto Maple Leafs Baseball Club in the International League in 1951, for a year. The next two years he returned to play in the minor leagues, (most of which by then were also becoming integrated), then returned to Canada to finish his career. 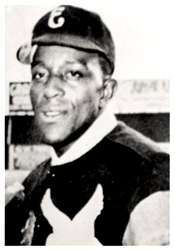 Day retired from baseball in 1955. In 1960, he was working in a Newark bar when he met Geraldine Ingram. She was in her early 20s, but she said that she liked how he treated women. After Ingram approached him, they went on a dinner date and began a relationship. They were married within about a year. The couple moved to Baltimore, where they supported the Baltimore Orioles baseball team. ↑ "Jackie, Satchel & Co". ESPN. Retrieved July 19, 2011. ↑ Ivice, Paul (2004-06-06). "Berra, baseball have D-Day legacy Former Yankee great was part of allied invasion". MLB.com. Retrieved 2008-12-25. ↑ Klingaman, Mike (October 29, 2014). "For Leon Day's widow, 'baseball is mental therapy'". The Baltimore Sun. Retrieved January 13, 2015.